If retractable banner stands aren’t currently the primary focus of your indoor-marketing efforts at trade shows and in your storefront, it’s time to re-evaluate your strategy. Since retractable banner stands are easily packable and transportable, they are ideal for making an impact at trade shows, where you don’t often have access to your entire marketing arsenal. Not only this, but it’s their ability to be customized with stunning graphic designs that makes them effective both in trade shows and in retail locations. To be effective, the sign should be sized for the expected viewing distance. A passerby as far away as possible in the aisle space should be able to read the main text without having to make a special effort. At the same time, leaving space around the edges your design and not filling all of the space with text will add the impact you need. The United States Sign Council (USSC) recommends a sign that is about 40 percent text and 60 percent blank space. The USSC also has specific recommendations about letter sizing for the strongest distance-reading impact. For instance, lettering that is three-inches high will have the most impact at about 30 feet. Lettering that is six-inches high will be most readable at a distance of 60 feet. Simply put, if you want someone to read your sign across a very broad aisle, the lettering just has to be big enough. Lettering that is three-inches high will not be legible beyond 100 feet. Lettering that is six-inches high will not be legible beyond 200 feet. If the space you are marketing to is very large, lettering that is 30-inches high can be read from up to about 1,250-feet away. The physical construction of a free-standing banner sign is an important factor in how successful it is in a busy environment with people moving past the sign constantly. In this case, the sign should be printed on reinforced vinyl or another heavy material, so that it is secure. A glossy surface usually shows off color and contrast the best. The base of the stand has to be heavy enough that the banner does not tilt or fall. Stands on pedestals are often unstable because their centers of gravity are too high. The best design may be a sign whose weight is centered close to the ground. Banners on retractable stands are often narrow and vertical. Because vertical signs are still considered non-standard in some areas, it can work to your advantage. Narrow vertical-shaped signs are often novel enough to attract attention and to stand out from the competing advertisements. How you angle the sign is another important factor. The important consideration here is how much you think passersby are willing to turn their heads, considering the space you occupy. If your sign is on a straight-away and people are rushing straight ahead, it is better if your banner sign is perpendicular, or at a steep angle to the path of travel. If your sign is in a crowded aisle with people shopping and looking around, you may have the best impact with banners facing the aisle. There are compromises, of course, with signs at angles or multiple banner signs at two diagonals and straight ahead. Resist the temptation to overload your banner sign with too much content. For indoor marketing like this, it’s more effective to keep the message very simple. If you are competing against other product signs, you need to be distinctive, but you need to do it in few words. One way to do this is to highlight unique features that give your product an edge, or by advertising the solution that your service offers, by using action-oriented words. Adding art or abstract color designs may add an attractive flair, but again, be careful not to overburden your sign with too much. Full color photographs are often effective design elements, as long as they, too, fit nicely with the lettering and don’t distract from the message. Act as physical guides to define a path through a trade-show exhibit or at a theater. Serve as reminders for patrons waiting in line. Direct attention to a particular product. Add color and interest to a waiting area or lobby, while providing useful information. Attractively advertise upcoming shows and direct patrons in museums and galleries. 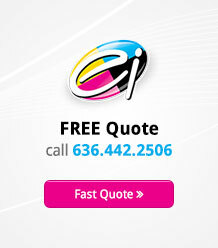 The bottom line is that retractable banners can have a big impact on your indoor marketing campaign. 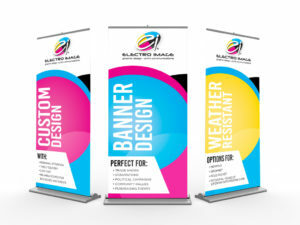 Your banner should be visually attractive and clearly communicate your message in a way that takes into consideration your setting and your purpose. Our design team can make sure that you meet each of these criteria. Whether your indoor-marketing efforts concentrate on trade shows or storefronts, a full color and sturdy sign that is designed to attract attention, will boost your leads and sales.